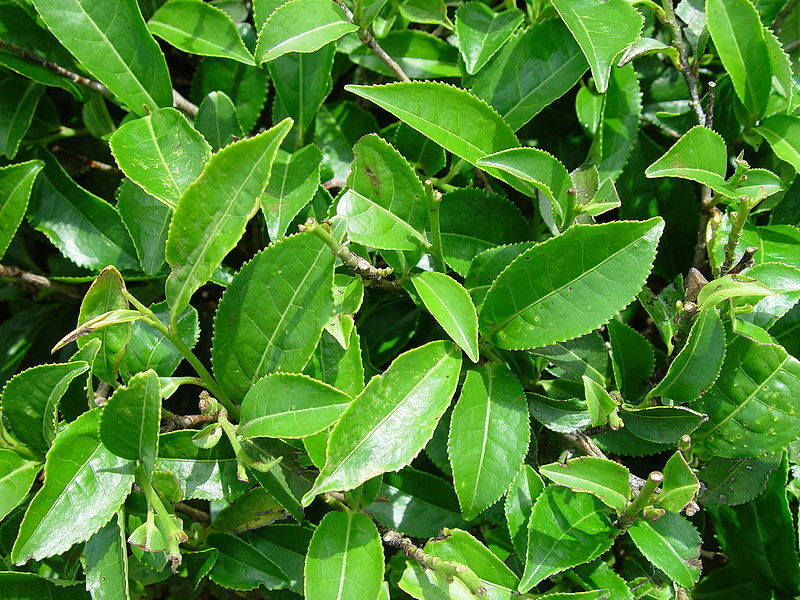 Foliage of a Camellia sinensis bush — the plant that “real” tea is made from. Language evolves. I get that. Sometimes changes make communication easier, clearer, or shorter. Sometimes, however, the evolution of the meaning of a word does exactly the opposite. The subject of this blog is a good example. The word “tea” refers to the tea plant (Camellia sinensis), the dried leaves of that plant, or the drink that is made by infusing those leaves in water. Technically speaking, all teas are tisanes, but most tisanes are not teas. In today’s culture, however, practically anything (except coffee and cocoa) that’s made by putting plant matter in water is called a tea. What’s my problem with that? It makes communication more difficult, less clear, and less terse. There is no other single word that means “a drink made with Camellia sinensis.” If we call everything tea, then we have to say “real tea” or “tea from the tea plant” or “Camellia sinensis tea” or something similarly ludicrous every time we want to refer specifically to tea rather than to all tisanes. There is a perfectly good word for “leaves infused in water.” There is no need to throw away “tisane” (or “herbal tea” or “infusion”) and replace it with a word that already has another meaning. That’s true. I sometimes slip and call rooibos a tea myself. “Herbal infusion” is even an alternate definition of tea in the OED. I still maintain, however, that it makes clear, precise communication more difficult when trying to differentiate between tea (made from the Camellia sinensis plant) and drinks made from chamomile, honeybush, and willow bark. Other words that go through this process are forced through it. Rooibos, for example, is the name for a specific tisane and the plant it’s made from (Aspalathus linearis). The word is Afrikaans for Red Bush. Despite the longtime use of the term in South Africa (the only place the rooibos plant grows), it was almost unknown in the United States in 1994 when Burke International of Texas registered “rooibos” as a trademark. This meant that in the United States, only Burke and its subsidiaries could use the common name of the plant. Had Burke not surrendered the trademark after starting to lose lawsuits, people would have been forced to come up with a new word. Unfortunately, that wasn’t a decisive victory, as the South African Rooibos Council is being forced to repeat the process now with a French company. As more people in the U.S. discover green rooibos, the name “red bush” becomes more confusing anyway. Rooibos, in my humble opinion, should remain the generic term here. There are other words in the tea industry that suffer from ambiguity and questionable correctness. You will find quite a bit of tea literature that refers to the oxidation of tea as “fermentation.” I had a bit of a row with Chris Kilham — The Medicine Hunter on Fox News — about this subject (it starts with “Coffee vs. Tea: Do your homework, Fox News” and continues with “Chris Kilham Responds“). Fermentation and oxidation are closely related processes. That’s certainly true. But oxidation is the aerobic process that is used in the production of black and oolong tea, and fermentation is the anaerobic process that’s used in the production of pu-erh tea. Using the word “fermentation” to describe the processing of black tea may fit with a lot of (non-chemist) tea industry writers, but it makes it difficult to explain what real fermented tea is. In chatting with friends, imprecise use of words doesn’t matter. If someone asks what kind of tea you want and you respond, “chamomile,” it’s perfectly clear what you want. But you’re an industry reporter, medical writer, or marketing copywriter, your job is to communicate unambiguously to your readers. Using the most correct terminology in the right way is a great way to do that. Posted on 11 January 2013, in Tea Thoughts and tagged Burke International, Chris Kilham, etymology, fermentation, herbal tea, infusion, oxidation, rooibos, SARC, South African Rooibos Council, tea, tisane, trademark. Bookmark the permalink. Leave a comment.